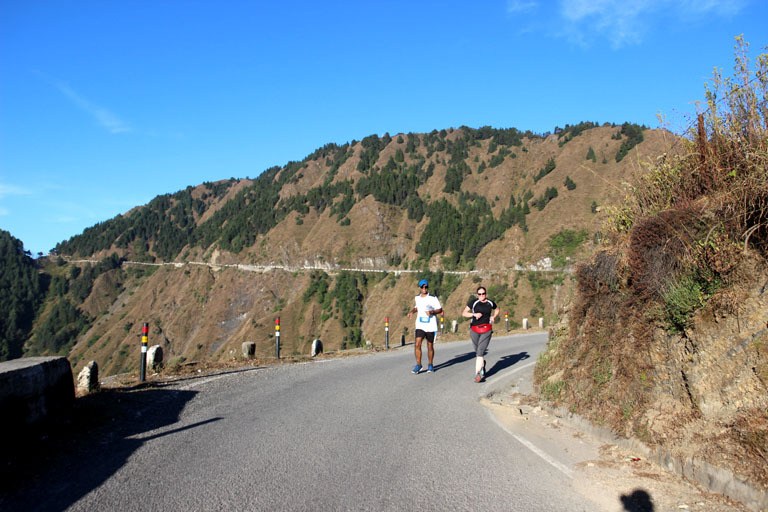 Mussoorie Half Marathon 2014 – Probably The Toughest Half Marathon in India! 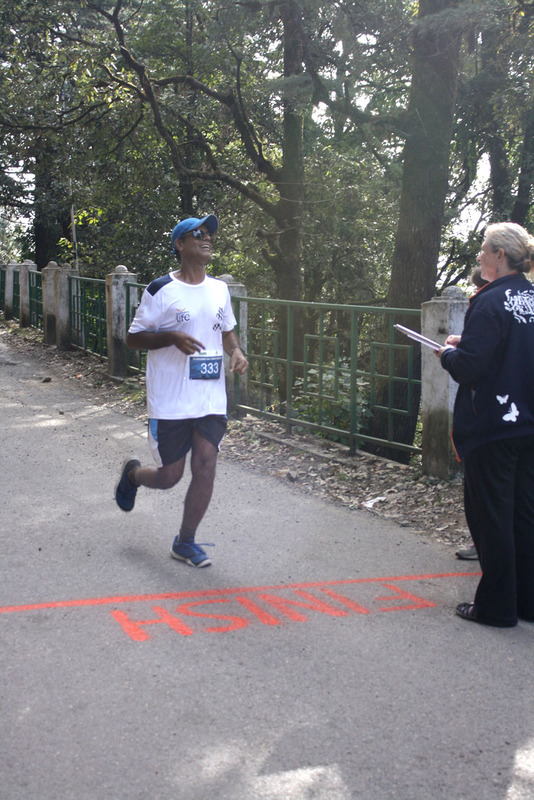 I was fortunate to have run the Mussoorie Half Marathon on Saturday the 1st of Nov 2014 as it was pretty much as near a perfect run as I can hope for! 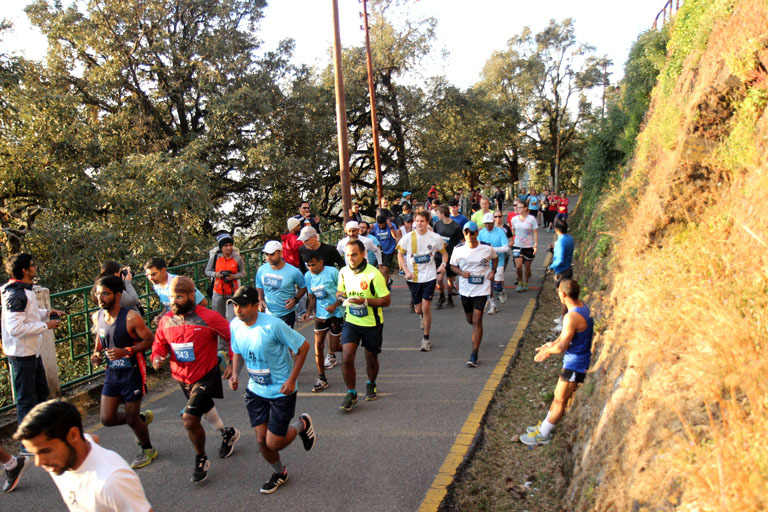 This was the third edition of the run and the first running this year of a new course that led along the ridge from Mussoorie to Dhanaulti. This was expected to be an extremely tough course and I’m glad to say, it was true to its word! I reached Jolly Grant airport in the afternoon and caught a pre-paid taxi till Mussoorie (cost Rs. 1600) The taxi raced manically with its horn blaring through the dusty Dehradun streets, populated by insanely adventurous drivers who love honking and overtaking at the slightest possible opportunity. I have seen this insane driving around Rishikesh all the way till Joshimath, so I think I can safely conclude that this is a common Uttarakhand problem! No one seems to have patience in this state! 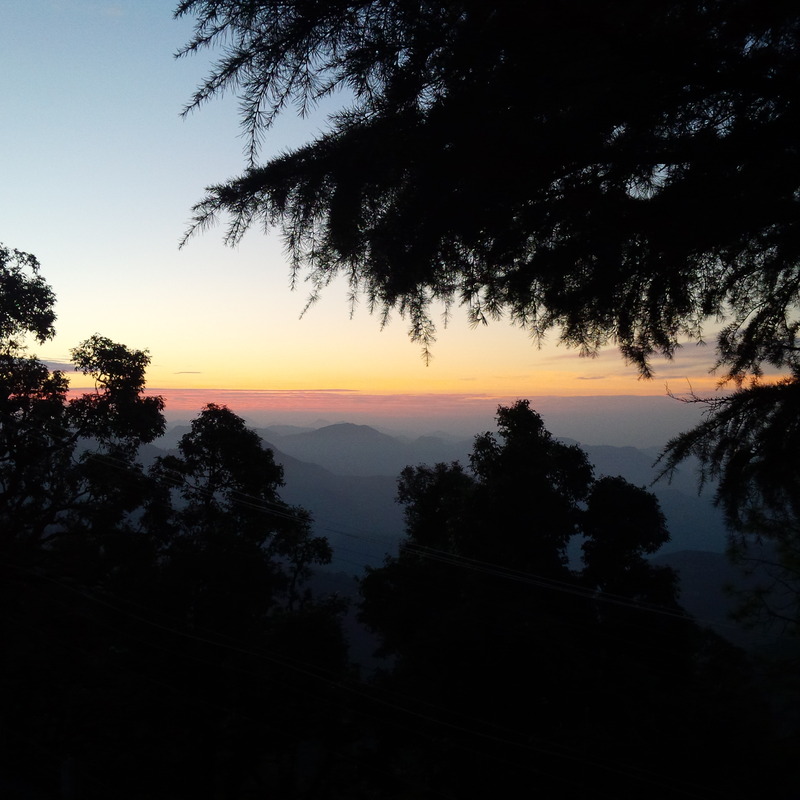 After a torrid 45 minutes of sensory annihilation, we finally escaped Dehradun and started out on the outskirts and up the slopes to Mussoorie. 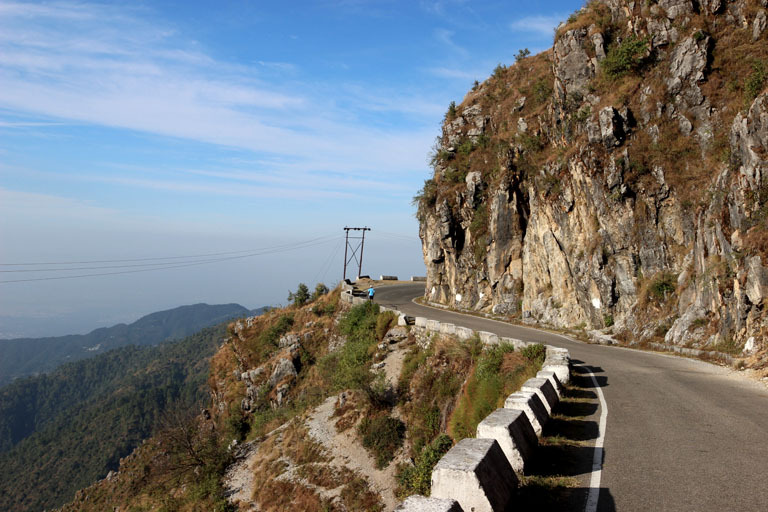 For a seasoned Himalayan traveller like me, the green hills do not provide anything exceptional…on the contrary they suffer from the same problem that every hill town in India does – haphazard development leading to ugly concrete structures perched sporadically along their sides. After a total of about 2 hrs and 10 mins, up winding slopes and switchbacks, we finally reached Mall road and I was dropped off near the point where the road forks off leading to Woodstock school. I called up my friend and fellow runner from Mumbai – Amar, and found that he was still about an hour away, so decided to tuck into a quick lunch while I waited. It was about 3:30 pm when Amar and I met at Mall Road and began the walk to Woodstock school gate for the race packet pick-up. The school is 3 kms from this point and the altitude keeps rising as we go further eastwards. After about 40 minutes of hauling our bags and ourselves over the slopes, breathing in the rarefied air and dodging the insane drivers, we finally reached the school gate. Steve Luukkonen, the P.E. 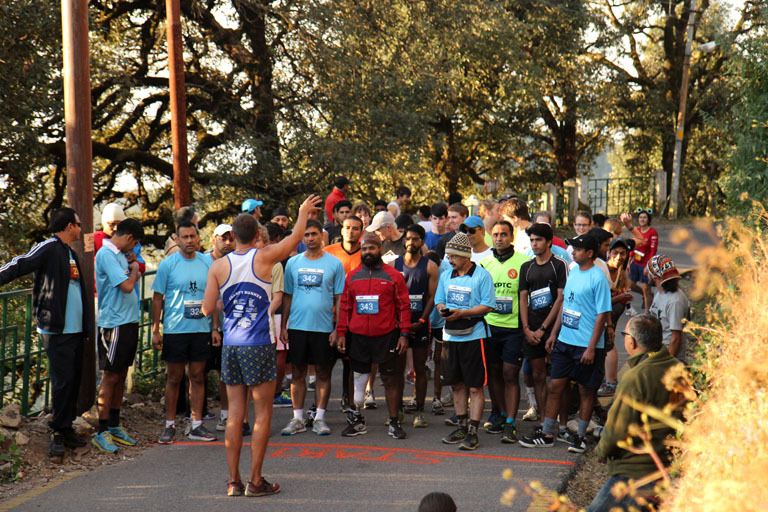 teacher at Woodstock School, is the driving force behind this run. He is a runner par excellence and an awesome, ever-smiling host! He was distributing the race packet personally and answering the queries we had. Steve incidentally has been the winner on both the previous occasions on the earlier route. This year was a new route and would be the first time the Half marathon would officially be run. 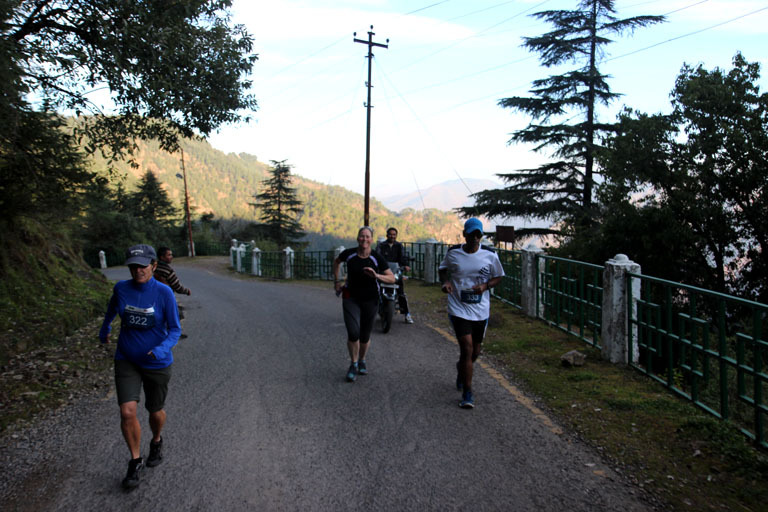 Steve explained that the run would begin from the gates of the HANIFL centre, one km further up the road, so we went walking ahead to recce and make sure we knew what awaited us the next day. 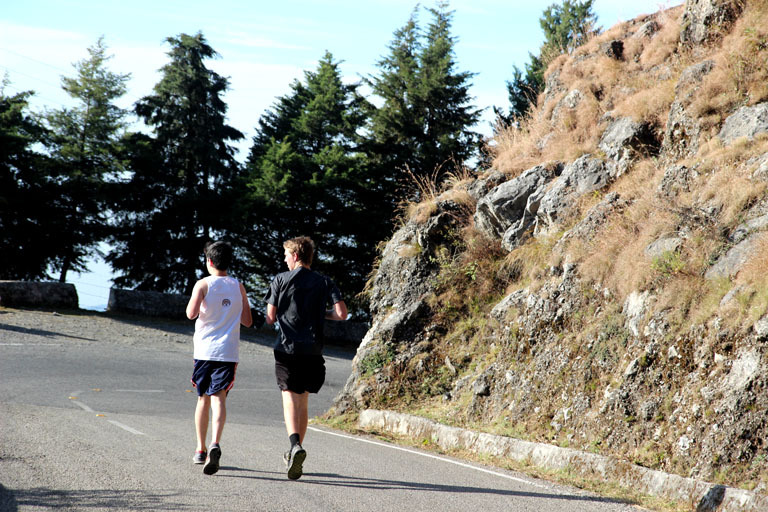 Running up the initial slope from the start point literally took our breath away and we knew tomorrow would be a real test. As we walked back and passed the school gates, we saw a couple of guys taking selfies with the Libyan flag draped around their shoulders. They waved a hello to us and we got talking. 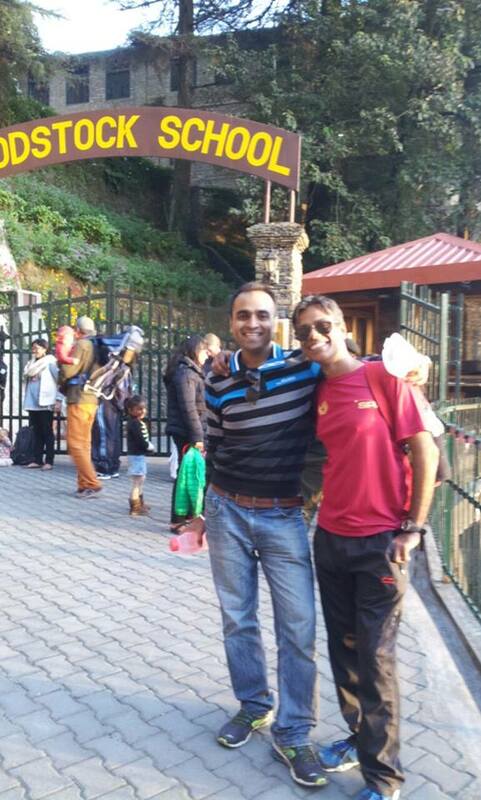 Both were friends, pursuing B Tech in a university in Dehradun and had been practicing for the event by running up slopes near their college. One of them was a Libyan – Walid, while the other was a Keralite – Vinod. We wished them luck and as the sun set spectacularly at the back, we parted ways. 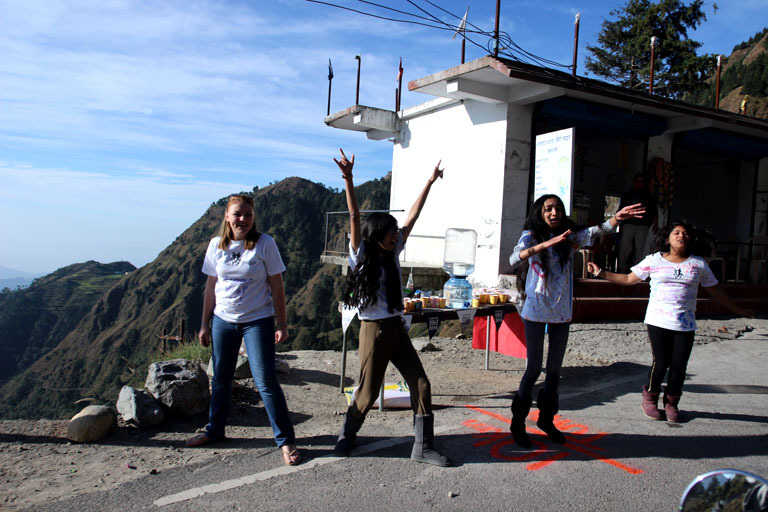 We decided to walk back to our hotel – Club Mahindra to help us acclimatise better and that was probably a smart move. 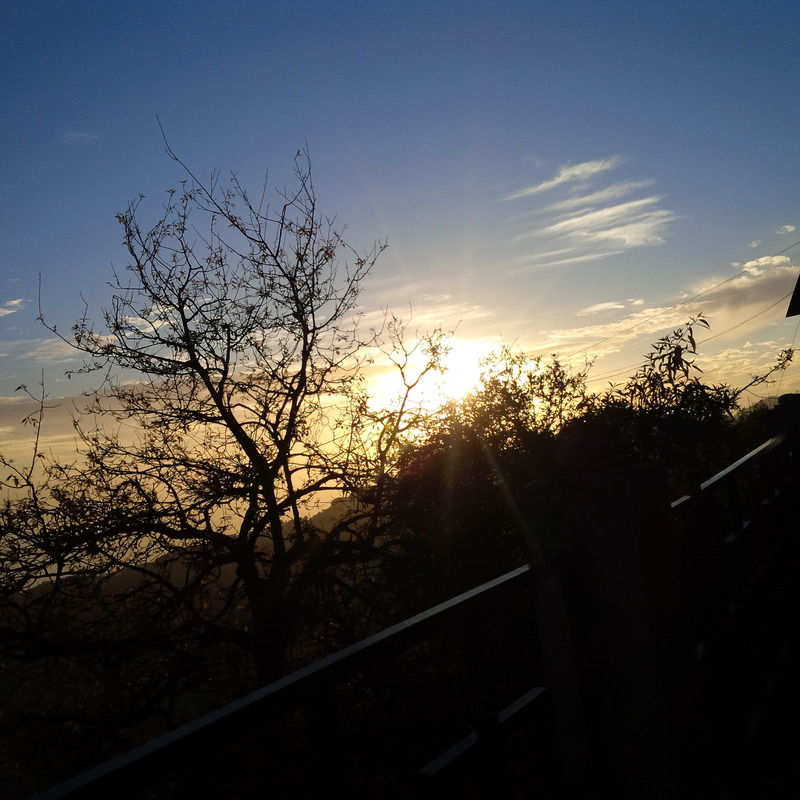 The walk back was pretty demanding as it was 5 kms from the HANIFL Centre and the fact that it was perched high up on Gun Hill meant there was a steep slope and a long flight of stairs to negotiate before we finally tumbled into our rooms around 7 pm. We were absolutely tired and after some coffee and freshening up, decided to have a quick dinner and turn into bed asap. Dinner begins from 8 pm onwards and we were the first in the restaurant … quickly ordered dal, palak paneer and rotis and somehow got it all down without falling asleep at the table! By 9, we were back, and within a minute of getting to bed I was asleep . We woke up at 4 am, got refreshed, had some badam milk and coffee and were ready to start marching. By 5 am, we were out of the room and marching down the Gun Hill slope to meet Saurabh at the junction of Library Chowk and Mall road. 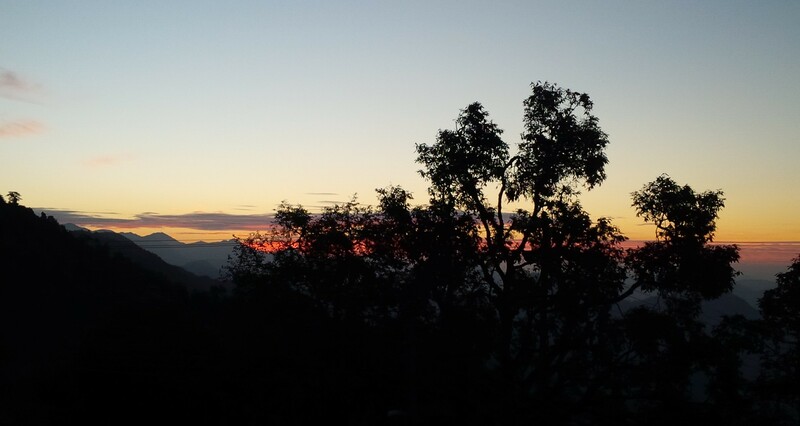 The lights of Dehradun glittered in the distance and the early morning sky was pretty clear and chill as we marched rapidly toward HANIFL Centre. After an hour-ish of brisk walking, we were at the centre by 6:15 am. The place was already bustling with Steve marshaling his troops along. A desk was quickly brought out for registration check-ins and runners were quickly and efficiently cleared out as per the distance chosen. Everyone was in great spirits and very friendly, and we met with and chatted up quite a few folks. The facilities were perfect – plenty of water, ample toilets and a spacious luggage cloak room. the start line was 100 metres down the road from the HANIFL Centre while the finish was right at the Hanifl gates, so we crossed the finish before we even began! A lovely sunrise peeked over the plains in the distance as we got ready to begin. The sunrise again, this time from the start line. All sensible advice… here he is “dictating” terms at the Start Line. General Steve at the Battlefield frontline. At about 10-12 mins past 7 am, we were off and running with Steve leading the way. As an aside, it was incredible to see a bladerunner (bib # 343) in the lineup (you can see him in the pic above right at the start) competing in an incredibly tough run. 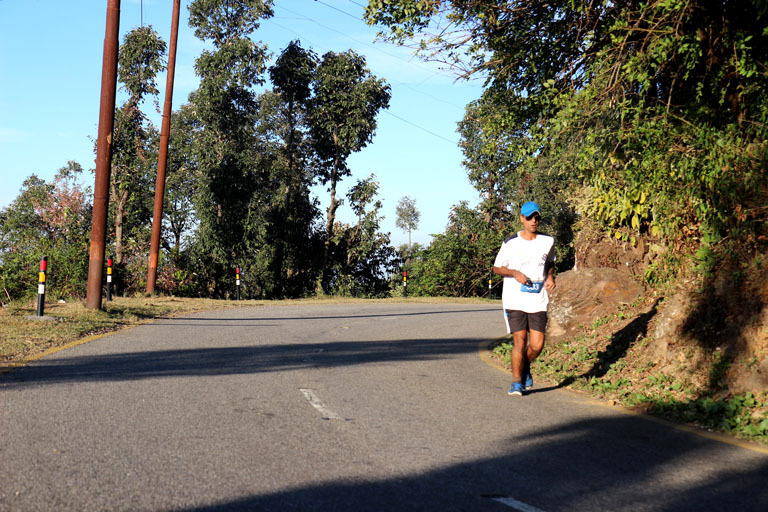 His name is Prakash Sodhi and he fought hard and completed the run with a superb time of 3:29. A true victory of the spirit and I am fortunate to have known him through this run. I hope to meet him again next year and run with him! …and the race begins! Amar can be seen in the fluorescent XPTC t-shirt zooming away ahead of me. 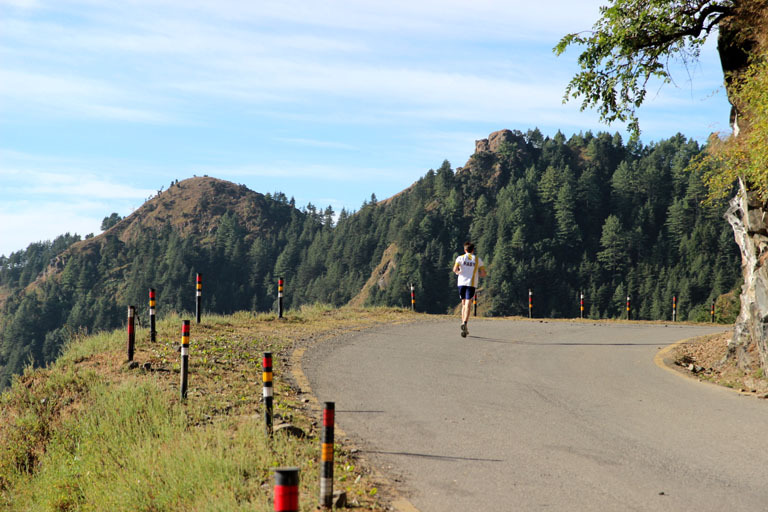 Everybody zoomed off down the short slope and then virtually raced up the steep slope, leaving poor me struggling at the back of the pack, slowly enjoying my way up, taking in the sights. The first slope after the start line is steep, although its not an insanely steep slope as it seems, and can be negotiated, IF one keeps his breathing regulated. It does take a toll on the legs and well, that’s the story for pretty much the entire course! there was a water station aorund the 1.5 km point and then another at the 2.5 km point. 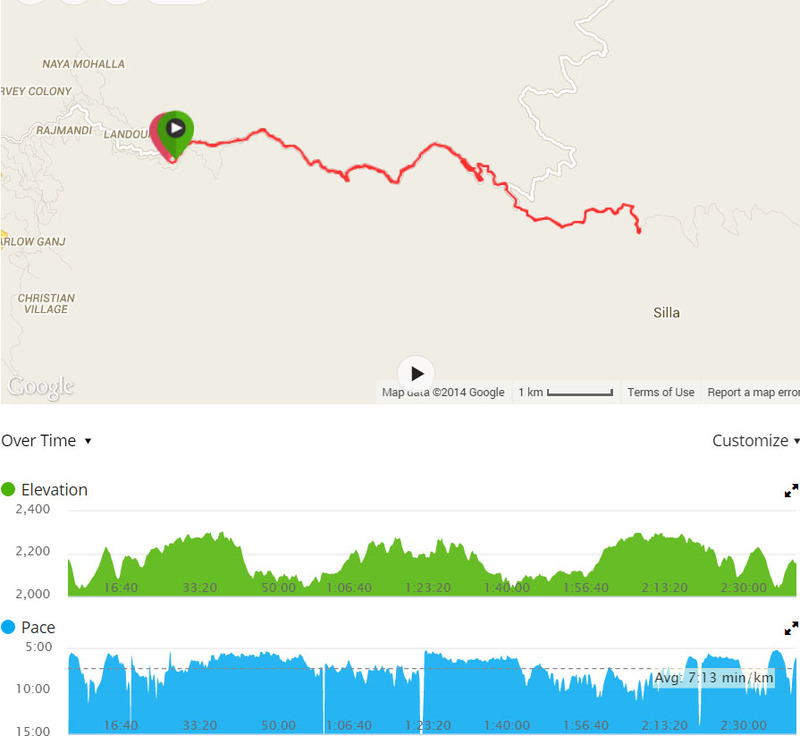 You can see the slopes from the route elevation at the end of the blog post and can also see my lap breakup times. The first couple of kms take you around a curve that is in shade and then finally open out on the other side around the 2.5 km water station into bright sunshine. The route there on largely continues in the sunshine for pretty much till the halyway point and back, which ensures the chill factor at the start is not really felt. (the temperature at the start must have been around 11-12 degrees celsius) Thankfully there wasn’t much wind, which meant that once warmed up, we actually enjoyed the lovely sunshine and the cool temperatures! me and Tara at the top of the first steep section, about to turn into the sun! There in the pic above you can see us, the “turtles” bringing up the rear of the runners. (even the bike dude seems to be looking at us quizzically) To my right is Tara Kaplan, an amazing lady, she is the nurse at the school, a superb, strong runner (who never stopped during the entire run!) and an absolute gem of a person. She was my running partner during the run, and it was thanks to her that I did not feel tired at all! In fact, its thanks to her that I enjoyed the tough run more than I have enjoyed any other run! I did not even know how the time went by and we had already reached the turn around point! My eternal gratitude to her for her company. The long downslope (3-4 kms) after the torrid upslope from the start-line (which was also 3-4 kms) is a relief and great fun. You can see the downslope all along our back (which obviously became the upslope on the way back) Around the 5 kms mark (I think) the road turns around and opens up a vista where the Himlayan range is usually visible, except that on our race day, the clouds had already come in and closed the mountains up. After the turnaround point, its a pretty similar grind back and the real test begins around the 15-16 km mark where the steep slope begins. I tramped on till the 17.5 km point and finally decided to take a long-ish break to rest my strained muscles! Tara however was as strong as ever and she disappeared into the distance without needing a single break while I manfully marched on. A pic of me solo probably not far from the end! …and finally after some serious effort in the ending stages (there was a half kilometre upward spike slope before the final km) I was at sight of the finishing line in 2 hrs 33 mins. 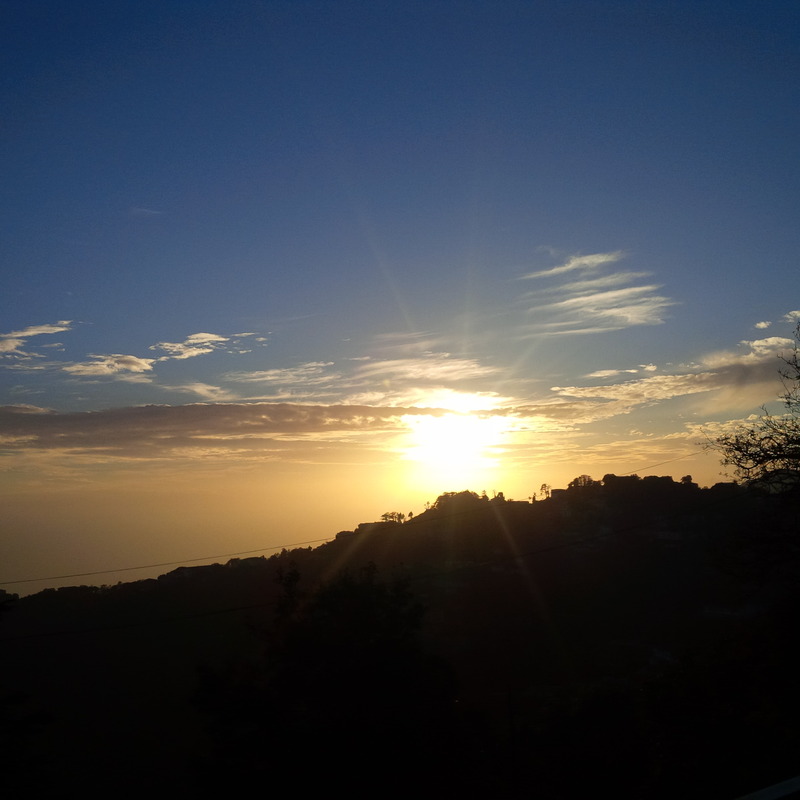 A total of approximately 6300 feet of elevation climbed with the minimum altitude being 6700 feet and the max being approximately 7600… a seriously tough half marathon ended very satisfyingly in 20th position. Post race, we all gathered at the HANIFL lawns and I gobbled down bananas and Parle G biscouts and a lot of water. That’s where I heard the news that the Libyan runner – Walid, who had been running really hard and well, had severe breathing trouble and collapsed due to the lack of oxygen, which led him to be taken away by ambulance. 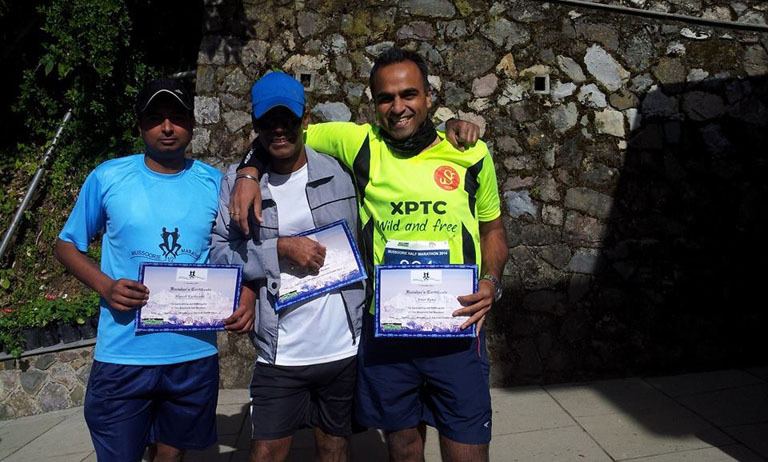 his partner, Vinod though finished strongly in 3rd place. I forgot to mention this but we spoke to Shishir at the end, and he confirmed that this Half marathon was indeed tougher than the Leh HM. He said that the Leh HM had only 2 real sectors of slopes while the majority was a gentle slope/flat run. the only issue there was the low oxygen which could be overcome if you stayed there for a week and acclimatised well. This HM though was much tougher with its constant and extreme elevation changes at altitude. So he rates this as much tougher than the Leh HM…and I will be trying this out myself next year and reporting back. The winner Nate, from new Zealand, set an absolutely stunning time of 1:25 which was obviously a course record and probably one that will stand for quite a while! Before I sign off with this report though, I would like to extend my thanks and a special mention to the incredibly enthusiastic cheerleaders at the water stations, whose screams of support (audible from half a kilometre away) were like a beacon of hope guiding me to the promised land (rest!). At the finish line, the starting sequential trio again! The promising runner Saurabh Singh from Agra who had been our companion at the start ended up 4th and was bitterly disappointed not to have got 3rd… missed out by a few seconds! 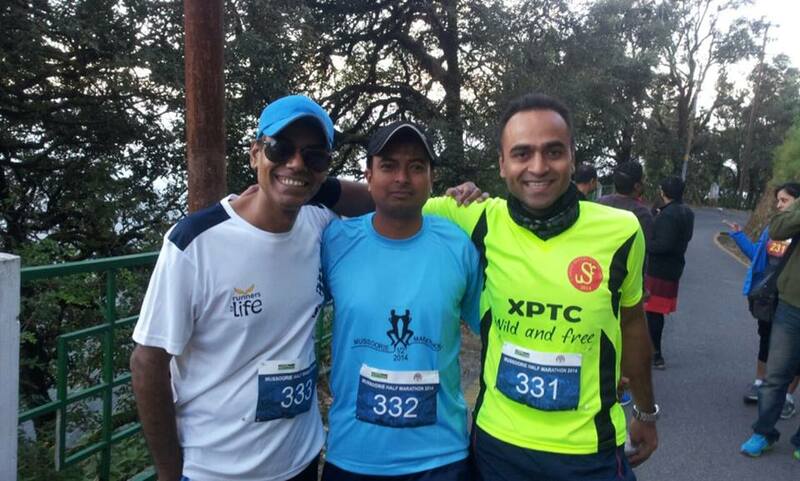 Amar finished 14th and Manish, on my right finished a few seconds ahead of me in 19th. As promised earlier, here is the route map and elevation and below it, the link to the Garmin race stats. 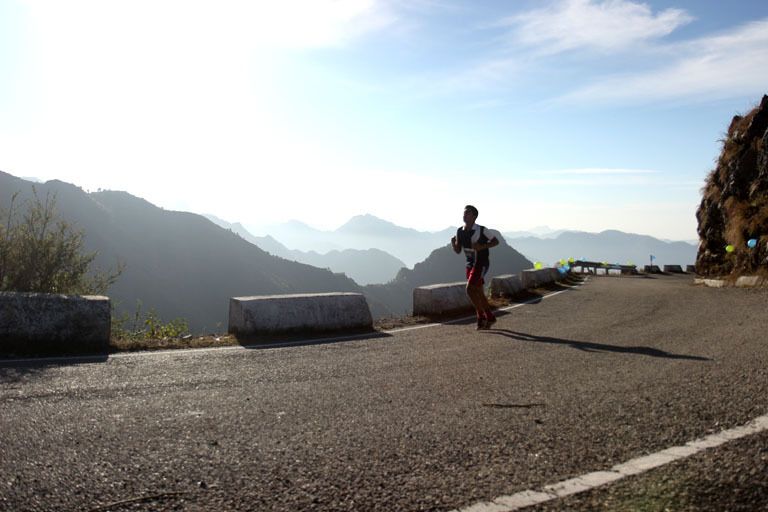 A few other awesome pics of the run below…hope many more Mumbai runners come along. Tara was wistfully hoping to have more female runners, sadly there were just too few and none from out of station. Hopefully our Mumbai ladies will join up and enjoy this truly fantastic run.